Shri. Laljee Tandon, Minister of Urban Development of Uttar Pradesh, present at the event, received Amma’s blessings. He lauded the great service Amma is rendering to suffering humanity every moment of Her life. The keys for 160 houses built under the Amritakuteeram project in Ghaziabad district were also handed over to the beneficiaries by Shri. Laljee Tandon, in Amma’s divine presence. The Hon’ble Minister assured all help required by the ashram for the housing projects to be taken up by the ashram in Lucknow, Ayodhya and Varanasi in the near future. “Amma is doing lot of charitable work for the downtrodden. Whatever is in my power to do I will do to support Amma’s work. Service of mankind is service of god. It is at feet of Amma, that the spark of divinity within us is ignited. What is needed in today’s world is removal of spiritual illiteracy. Man has attained phenomenal knowledge in the outside world but has lagged behind in the development of the inner-world of man . Morally and socially man is retarded. Scientific advancement cannot solve human problems. If it could have, there would be no suffering for humanity. One has to strike a balance between spirituality and science for inward and outward joy. In my opinion Ammaji’s mission is pointed towards that. The program in Ahmedabad was finished; the long trek (two days by bus) from there to Delhi, via Pushkar, had begun. It was dark, chai was being brewed, and the tour members were seated around Amma on the ground, eager for whatever laughter or satsang or singing might occur. One never knows, with Amma! When Mother heard these words that evening while the chai was being brewed, Her Face shone with delight. “Saranagati,” She said. It was translated: “Real Surrender.” The goal, indeed, of spiritual aspirants is something the people of Gujarat are showing us. The Speaker, Gujarat Legistative Assembly, inaugurated the rehabilitation project of earthquake affected villages of Kutch district of Gujarat, adopted by the Ashram. The evening public program on 17th March 2001 took place at the Siddhi Vinayak grounds in Prabhadevi, Mumbai. Chhagan Bhujbal, Deputy Chief Minister of Maharastra welcomed Amma. On the next evening (18th March), the program took place in Goregaon. Traditional music performances welcomed Amma at the venue. AICT Pune was inaugurated during Amma’s visit to Pune on 14th March, 2001 at 7:00 PM by Dr. Ashok Kolaskar, Vice-Chancellor, University of Pune in the Divine Presence of Amma. The programme also hosted other dignitaries like Dr. Vijay P. Bhatkar, Chairman, Dishnet Research Laboratory, Dr. S. K. Gupta, Director & CEO of Software Technology Park, Pune, Prof. Ram Takwale, Chairman, Committee on I. T. in Higher Education, Maharashtra, Sri. Vivek R. Sawant, Director, IIIT, Pune and Sri. Lakshman Pandurang Jagtap, P. C. M. C. Mayor. Dr. Ashok Kolaskar said that he and the people of Pune are proud to have such an institution for the first time in Maharashtra which provides not only high-technology which has been the part and parcel of ones life but also love and faith which are now slowly vanishing from the world. In his speech he said that in a couple of years human clones, humanoids, might be a reality. But the quality of social interaction is going down and moral values are losing out to the market culture. He said that institutions like AICT will prove to be very crucial in fulfilling this need of society. Dr. Vijay P. Bhatkar gave an example of how sage Vishwamitra had created a new world through his tapas. In the same manner computers are creating a new Digital Reality World altogether. But even though there are many languages like C, Cobol, Java etc. the language always found missing is the language of Love. This is what Amma pours into computers through Her computer institutes. AICT, indeed as Sri. Krishnan concluded in his thanksgiving speech will indeed prove to be the “Amrita Institute of Character Transformation. On the last day of program, a devotee adorned Amma in Krishna costumes at the end of the day’s darshan. Amma/Krishna took butter from the pots offered to her, and drank buttermilk from the pot. The earthquake that struck Gujarat in 2001 claimed the lives of almost 20,000 people. Amma’s response was immediate. AIMS Hospital dispatched a disaster-relief team of a dozen surgeons and two fully equipped ambulances that facilitated expert trauma care in the devastated areas. The doctors performed lifesaving operations in extremely makeshift conditions. One hundred students from Amrita University helped by recovering bodies from the rubble, distributing clothes and feeding and comforting survivors. After the initial crisis was over, Amma’s monastic disciples and volunteers remained, working tirelessly to help rebuild the people’s lives. MAM constructed three villages—a total of 1,200 earthquake-proof houses, as well as community halls, a school, several temples and a mosque. At a joyful inauguration, where thousands came to greet Amma, L.K. Advani, the deputy prime minister of India, distributed keys to the beneficiaries. Out of gratitude, the people renamed their villages after Amma. Four years later, Amma’s support still had such an impact on the people that the village leaders made the three-day journey to Kerala to help Amma rebuild houses for tsunami victims. Why would Mother be interested in the lorry? Why the rush? At the end of every program on the road, the lorry comes close to the bookstall and the stage, and brahmacharis (western and Indian male ashramites) load the boxes of books and photos and ayurvedic products, and the sound system, and the displays – everything in its place and ready to unload at the next venue. What was different tonight? Tonight the brahmacharis would not do the loading. The women would. Western women and brahmacharinis together would do this “men’s job”. Mother was so enthusiastic about it that She wanted them to finish loading in time to come to Her for darshan – a very rare treat for people travelling with Mother. But why should women do this job? Don’t they have enough to do, chopping vegetables and cooking vadas and making fruit juices? That’s women’s work. Loading trucks is men’s work. But just the day before, at a lunch stop along the road en route from Hyderabad to Pune, Mother had announced that She wanted the girls (women are girls, and men are boys, in the parlance of the Mother of All) to load and unload the buses and trucks next – and perhaps for some time to come. Were there any volunteers? Hands shot up; Mother took names; western women and brahmacharinis eagerly signed up and a work roster was made. Expectations were turned on their heads. That is Mother’s way: to shatter assumptions, to break expectations, to push people into new and challenging roles, and to show us all that we are capable of far more than we (or others) have presumed. Women CAN be strong; men CAN be soft. Women CAN do “men’s work”, and men CAN do “women’s work”. Now and then, Mother decides to drive that lesson home; this was one of those times. In Hyderabad or ‘Cyber-abad’, India’s second Silicon Valley, the first days evening program was held at the Pingale Reddy Hall in Lower Tank Bund Road. Incidentally this day was Holi Day. This festival marks the transition from Winter to Summer and also the beginning of the Harvesting season and is therefore a cause for celebration. So Amma’s devotees have a double reason for celebrating – it being Holi and Amma’s first day in Hyderabad after a gap of one year. Many of the Devotees who came were multi-hued, their hands and faces bearing the different shades marking the festivities of the day. The function on the 10th March was attended by the Minister of State for Home Affairs, Sri. Vidyasagar Rao who graciously acknowledged that social transformation is mostly not brought about by politicians but by Spiritual Leaders like Amma who selflessly serve the poor and needy. Sri O.Rajagopal, Minister of State for Railways and Parliamentary Affairs, also attended the function. The second programme in Hyderabad was held on the 11th March in the new ashram premises on Mahindra hills, Secunderabad. Amrita Vidyalayam, the ashram’s CBSE school in Hyderabad was inaugurated by the Hon’ble Minister O. Rajagopal, Minister of State for Railways & Parlimentary affairs. This will be the 38th school of its kind under the management of the ashram. Hon’ble Minister of Roads & Bridges, Govt. of Andhra Pradesh, Vijaya Rama Rao recieved symbolic key of Amrita Kuteeram free housing complex from AMMA. This project provides homes to 600 poor families in Hyderabad. The land was donated by the State Government. It was a foreboding site full of rocks and massive boulders. 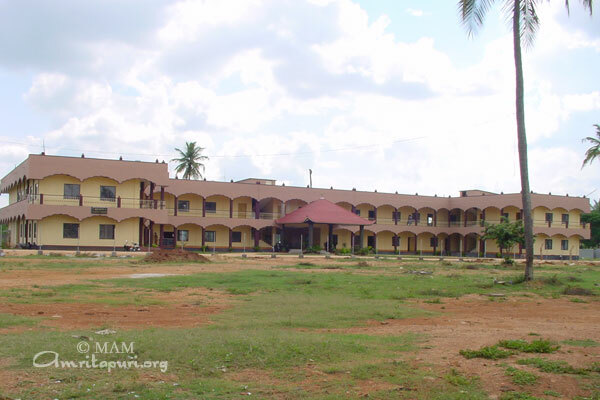 The above buildings of the ashram and the school were built in four months in anticipation of Amma’s visit. Up to the afternoon of the programme, devotees worked tirelessly clearing the area for the programme and building the stage. The programme started at 6.30 in the evening, workers were still adding the final touches as Mother came to the stage. Today Sri Mata Amritanandamayi Devi was given a public reception at the Central College Grounds, Bangalore. Sri A. Krishnappa, the Minister for Animal Husbandry and Sugar in Karnataka, welcomed Amma on behalf of the Government of Karnataka and spoke about the various social service schemes of Mata Amritanandamayi Math. Sri M.V. Venkatappa, the Honorable Speaker of the Legislative Assembly of Karnataka inaugurated the Amrita Kuteeram Project for Bangalore district. He said that Amma has been providing spiritual guidance to society and also helping the needy people through Her various service schemes. Sri H.C. Srikanthaiah, the Minister for Revenue in Karnataka, said that the government alone could never fulfill the needs and aspirations of the people and that the government fully supports the social service, educational and health service activities of Amma. He was all praise for the way the Amrita Kuteerams are constructed. He said that the Brahmacharis and the Volunteers are better than the engineers employed by the government because the Brahmacharis and the Volunteers have built the houses with love, a sense of service and a keen sense of moral responsibility. He promised to assist the Mata Amritanandamayi Math to get land in the southern part of the city to construct an Ashram. He launched the Amrita Nidhi Pension Scheme for Karanataka under which the destitute and financially disadvantaged widows will receive monthly pension from the Math. The Government of Karnataka has given 22.5 Acres of land in Bangalore on which the Mata Amritananandamayi Math is going to construct a Housing Colony, a school and an IT based Engineering college. A crowd of nearly 5000 devotees attended the program, participated in bhajans and had Amma’s darshan. During Amma’s visit to Mysore in March 2001, Sri S.M. Krishna, Chief Minister of Karnataka visited the Mysore ashram and had the honor to inaugurate the Amrita Kripa Hospital Project, the AICT Mysore, and handed over the keys to the beneficiaries of Amritakuteeram Project. The Chief Minister said that the service projects initiated by Amma reflect Her greatness, for Amma is not motivated by any political ambitions neither a desire to get more votes nor become a Chief Minister nor the Prime Minister or the President but these activities arise out of selfless love and compassion. He called Amma the very incarnation of simplicity. He felt that the whole society has a dream of happy living and no government can fulfill this by itself. Only service institutions like Mata Amritanandamayi Math can help realize the bright future that we all desire. The Chief Minister assured full cooperation for the social service activities of the Mata Amritanandamayi Math. He was all praise for the social, educational and health service activities of the ashram. He felt that Amma has transcended the limitations of language, caste and creed. The very fact that her activities are not limited to Kerala alone but spread all over the country shows that Amma is the real mother of all. The Chief Minister referred to Amma’s speech at the UN and said that Amma’s participation has made every Indian feel proud. He added that Amma is shouldering the burden of the State Government in the development of the downtrodden and the poor. He said that the people of India should be grateful to Mother for operating all over the Country, and not just in Kerala. He said that the Karnataka government is committed to encourage and extend all support to Amma and the charitable activities initiated by Her. Standing with Amma on the stage before Her regular morning program, the Chief Minister’s duty was to hand over to the new homeowners, former slum dwellers, the keys to their new houses. Amma would receive the key from Premamrita Chaitanya, and then give it to the Chief Minister, who in turn would hand it to the new homeowner. When the first woman approached, there was a certain stiffness of formality, but by the time of the second Amma could no longer resist reaching out and hugging the woman who clasped her new key to her bosom. How could Amma, who is always there to wipe tears from Her children’s eyes, not reach out? For the grateful woman was wiping tears from her own eyes. We can be sure they were not tears of grief. Sri Viswanath, Minister for Education, Sri Deshapande, Minister for Industries and Sri Shivanna, Minister of State for Finance and Sri Gurumurthy, MLA were also present on the occasion. Sri SM Krishna handed over keys of the Amrita Kuteeram houses to 300 houseless people from Mandya District, KR Nagar Taluk and Gokulam Slum Area in Mysore. He said that those who are suffering from poverty and starvation don’t want religion. Realising their need Amma has initiated many service projects which aim to fulfill the basic needs of such people. He said that this was true spirituality. Sri S.M. Krishna also laid the foundation stone for the `Amrita Kripa Charitable Hospital,’ and inaugurated the `Amrita Institute of Computer Technology’.